So today I am another year older! And hopefully wiser but I highly doubt it lol. Now I had intended this to be an ice-cream manicure however everyone said my mani reminded them of cupcakes and NOT ice-cream so I guess it's turned into a cupcake mani! Pinky: I used 2 coats of Barry M Strawberry Ice-cream as my base and Canmake 101 for the chocolate icing. For the sprinkles I used OPI Alpine Snow. Ring finger: I used 2 coats of Barry M Berry Ice-Cream and OPI Alpine Snow for the icing. For the sprinkles I used China Glaze Happy Go Lucky and Empowerment. Middle finger: For the base I used China Glaze Re-Fresh Mint and Canmake 101 for the chocolate icing. For the sprinkles I used OPI Alpine Snow and China Glaze Sugar High. Index finger: I used 2 coats of Color Club Who Are You Wearing? for the base and China Glaze Sugar High for the icing. Sprinkles were China Glaze Happy Go Lucky and Flyin' High. 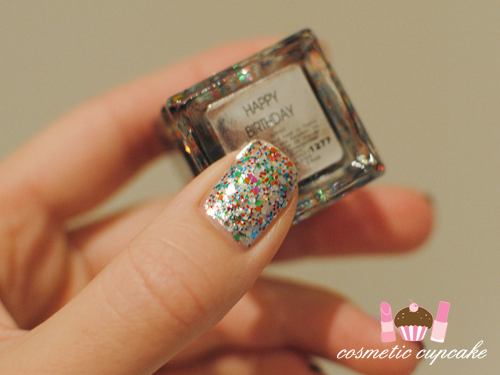 Thumb: I used 1 coat of NYC Color snazzle and 2 coats of Deborah Lippmann Happy Birthday. Gosh I am really loving rocking this mani! I need to practice my drips but oh well. 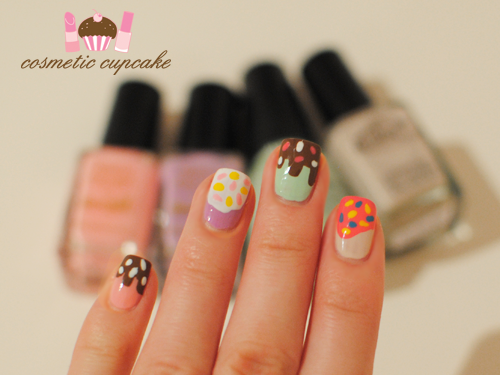 Expect more drippy/ice-cream manis in every different colour in the future LOL. My gifts from the family and D! The parents gave me an agnès b makeup set and a red packet (ie. cash woot!) and D and my sis gifted me a nail course from Nail Boutique Le M that I've been wanting to do for AGES!!!!!! Yay! D also gave me OPI DS Magic and Extravagance, yummy Adora truffles and a cute Rilakkuma =) My yummyt birthday cake is below! I hope you all had a lovely day! Thanks for looking and don't forget to enter my 2nd birthday giveaway here! Happy Birthday! Great gifts and that cake looks amazing! I really envy your patience! I'd love to do more nail art but I can never find the time/energy to try! Gorgeous cake and such sweet nails! Happy Birthday Hun! They are lovely. Your nail shape is really nice too. WOW! So cute! I've just bought a very very very similar to that Deborah "Happy Birthday" nail polish and it's from essence-special effect topper and it's 02 circus confetti. It's just awesome! I love it! Happy Birthday! Your manicure is adorable! Ahhh these are super cute! Happy Birthday!! squee!! this is super cute! 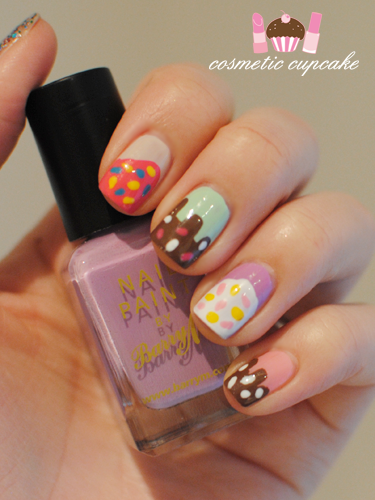 This is a cute and gorgeous and yummy mani 'Chelle! I love it, and I wish I were as talented as you! Happy Birthday!!! Your nails are super cute! 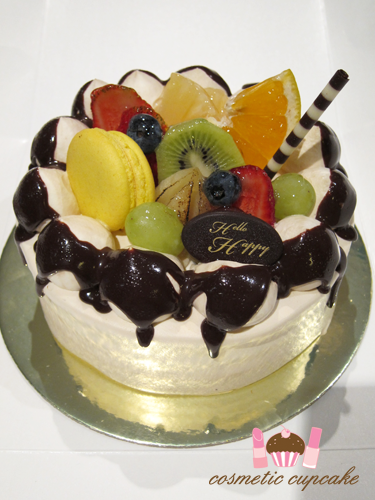 Happy Birthday to you!! That mani's one of your best! This is too adorable and super creative! Wow, the application is done amazingly well. Happy belated birthday, I hope you had a lovely day. happy birthday! 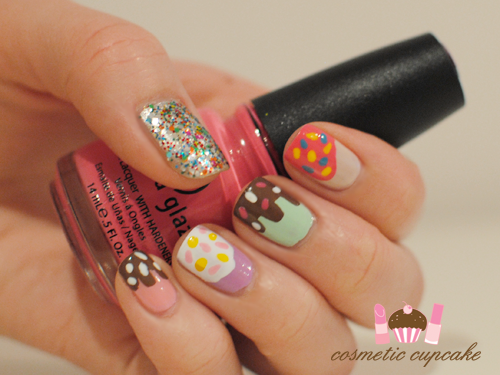 love the cupcake/icecream mani! Belated Happy Birthday. 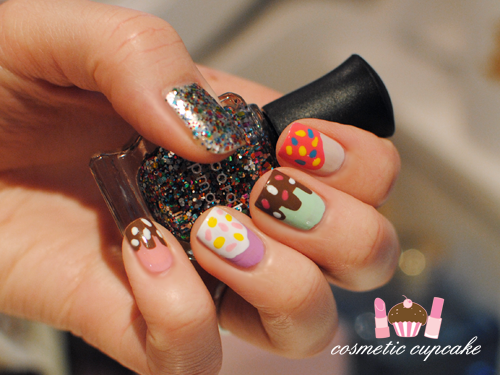 Your nails designs and Cosmetic Cupcake is awesome. Wishing let the god almighty keep you safe and well for the years yet to come.. God Bless you! Belated, but better late than never - happy birthday! :) And gosh that cake looks really delish!